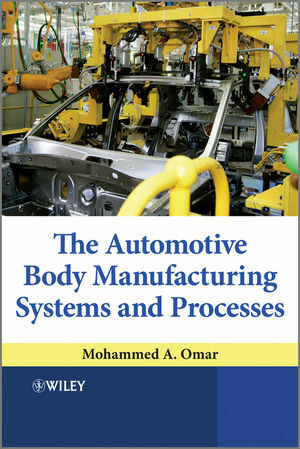 A comprehensive and dedicated guide to automotive production lines, The Automotive Body Manufacturing Systems and Processes addresses automotive body processes from the stamping operations through the final assembly activities. To begin, it discusses current metal forming practices, including stamping engineering, die development, and dimensional validation, and new innovations in metal forming, such as folding based forming, super-plastic, and hydro forming technologies. The first section also explains details of automotive spot welding (welding lobes), arc welding, and adhesive bonding, in addition to flexible fixturing systems and welding robotic cells. Guiding readers through each stage in the process of automotive painting, including the calculations needed to compute the number of applicators and paint consumption based on vehicle dimensions and demand, along with the final assembly and automotive mechanical fastening strategies, the book's systematic coverage is unique. The second module of the book focuses on the layout strategies of the automotive production line. A discussion of automotive aggregate planning and master production scheduling ensures that the reader is familiar with operational aspects. The book also reviews the energy emissions and expenditures of automotive production processes and proposes new technical solutions to reduce environmental impact. Mohammed A. Omar received his PhD in Mechanical Engineering from the University of Kentucky in 2005, and his BS in Mechanical Engineering from the University of Jordan in 2001. He previously worked as a visiting scholar at the Toyota Motor Company headquarters in Japan. Currently he is an assistant professor of Mechanical and Automotive Engineering at the Clemson University International Centre for Automotive Research CU-ICAR. Dr. Omar's main research is in the area of intelligent manufacturing applied to automotive production lines and systems. His work has resulted in 4 patents and over 60 journal publications and conference proceedings. Additionally, Dr. Omar is the recipient of the SAE Foundation Manufacturing Leadership Award for 2009, and his published work in controlling the manufacturing processes using thermal imagery was awarded the most outstanding SAE technical publication in 2009. Dr. Omar's research is currently funded by Toyota Motor Company, BMW Group, Nippon Steel Corporation, the US Army, Michelin, in addition to other company and federal organizations. He is an active member of the ASME, SME, ASNT, SPIE and the AWS. 1.1 Anatomy of a Vehicle, Vehicle Functionality and Components. 1.2 Vehicle Manufacturing: An Overview. 2 Stamping and Metal Forming Processes. 2.1 Formability Science of Automotive Sheet Panels: An Overview. 2.3 Automotive Stamping Presses and Dies. 2.4 Tailor Welded Blanks and their Stamping. 2.5 Advances in Metal Forming. 2.6 Stampings Dimensional Approval Process. 3.5 Welding and Dimensional Conformance. 3.6 Advances in Automotive Welding. 3.7 The Automotive Joining Costing. 4.3 Paint Curing Processes, and Balancing. 4.4 Under-Body Sealant, PVC and Wax Applications. 4.5 Painting Spray Booths Operations. 4.6 Material Handling Systems Inside the Painting Area. 5.1 Basics of Final Assembly Operations. 5.2 Ergonomics of the Final Assembly Area. 5.3 Mechanical Fastening and Bolting. 6 Ecology of Automotive Manufacturing. 6.1 Introduction of Automotive Manufacturing Ecology. 6.2 Energy Consumption and Accounting. 6.3 The Automotive Materials' Ecological Impact. 6.4 The Painting Process Ecology. 6.5 Ecology of the Automobile. 7 Static Aspects of the Automotive Manufacturing Processes. 7.6 Lean Manufacturing Tools for Layout Design and Optimization. 8 Operational Aspects of the Automotive Manufacturing Processes. 8.3 Master Production Scheduling (MPS). 8.4 Material Requirement Planning (MRP). 8.5 Production Line Control and Management Style. 8.6 Selection and Management of Suppliers. 8.7 An Overview of the Automotive Quality Tools.